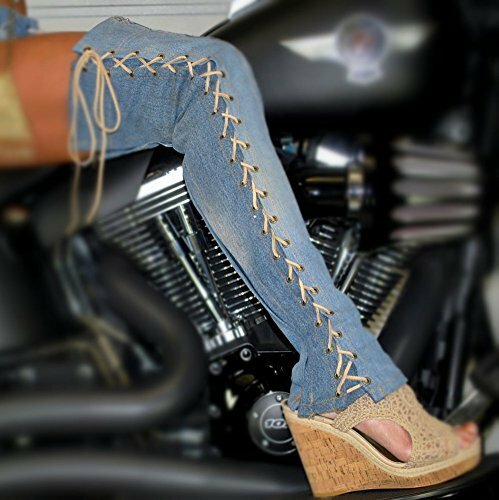 Transform an ordinary pair of heels, tennis shoes, ankle boots or even flip-flops into a pair of sensational over the knee lace up boots...Stivalettos! I use repurposed denim and feature tough stitching, brass grommets, and strong, smooth operating brass zippers. Stivalettos have a tapered customizable fit and exclusive design. In consideration that each and every woman is unique, I have allowed for modifications to be made via the suede lacing that runs along the outside of each Stivaletto. The suede lacing provides 4 additional inches of adjustment from ankle to thigh. With this feature, you are able to create a totally custom fit! PRIOR TO PLACING YOUR ORDER please be sure to precisely measure yourself in the following fashion: 1) Ankle: Measure directly around your ankle bone. 2) Calf: Measure around calf at the largest point. 3) Knee: Measure around center of knee (patella) 4) Thigh: 2" above the center of the knee (patella), measure around the thigh. 5) Thigh: 4" above the center of the knee (patella), measure around the thigh. 6) Thigh: 6" above the center of the knee (patella), measure around the thigh. 7) Height: Measure up 24" from the bottom of ankle bone and at that location measure around the thigh. Once you have taken the above measurements you can then compare them to the sizes listed below and select your size. If you have specific sizing or fitting requirements outside of the sizes listed below, please feel free to contact me. Additional sizes are most certainly available upon request. XS/S Ankle: 9" to 13" Calf: 11" to 15" Thigh: 15" to 19" Height: 24" S/M Ankle: 11" to 15" Calf: 13" to 17" Thigh: 20" to 24" Height: 24" M/L Ankle: 13" to 17" Calf: 15" to 19" Thigh: 22" to 26" Height: 25"